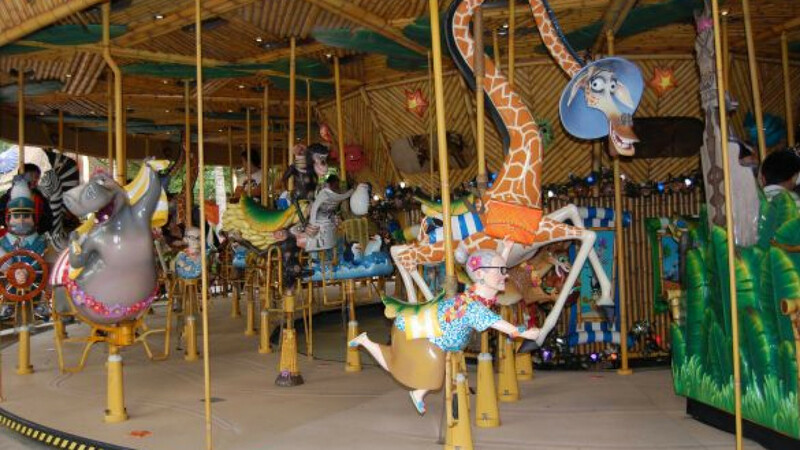 A merry-go-round ride decorated with Madagascar characters at the Universal Studios theme park in Singapore. DreamWorks Animation is challenging fellow U.S. media company NBCUniversal for the title of first major theme park operator in Russia, just as the overall entertainment-park market is heating up from competition small and large. DreamWorks chief executive Jeffrey Katzenberg announced at a Moscow press conference that his company will open parks near Moscow, St. Petersburg and Yekaterinburg in 2015, or more than three years ahead of NBCUniversal's Galactica Park in Moscow. With the designs for the parks done and two of the sites acquired, "we're ready to go," Katzenberg said in an interview with The Moscow Times. Each site is expected to consist of a year-round theme park, 400-room hotel, concert hall, 4-D movie theater and a mall, and those components will be launched simultaneously at each site. "They're not being built in stages or in phases," he said of the parks. Katzenberg, a heavyweight among U.S. studio chiefs, said he has met with city officials, such as representatives from Moscow Mayor Sergei Sobyanin's office, and with federal officials to promote the DreamWorks plan. The cost of building all three DreamWorks parks will be roughly $1.5 billion, said Amiran Mutsoyev, a board member of Regions Group, which is DreamWorks' development partner for the ambitious project. The price tag for each park will be about $500 million and will depend on the specifics of the site, he said. Regions has already acquired the land for the St. Petersburg and Yekaterinburg projects, but it hasn't yet bought up the needed parcel for the Moscow region site, Mutsoyev said. Both Mutsoyev and Katzenberg acknowledge that they are competing with NBCUniversal and the Universal Studios complex that it is planning to open in southern Moscow in 2018. A spokesman for the Universal Parks & Resorts division of NBCUniversal wasn't immediately available for comment. NBCUniversal announced its plans for Galactica Park in April, saying it was joining hands with U.S. promoter Anschutz Entertainment Group and Russian conglomerate Bin Group to build a 22-hectare complex. It is supposed to include a 150,000-square-meter Universal Studios theme park, which is likely to have rides and adventure zones. There also will be two hotels with a total of 1,100 rooms, two office towers, a sprawling shopping complex, a convention center and an indoor water park. Like the DreamWorks proposal, Galactica Park is supposed to be an enclosed space that can be used year-round, even during Russian winters. Mutsoyev said the DreamWorks sites will have a competitive edge over Galactica Park because they are targeted to children and teenagers, segments more profitable than the adult one, according to Regions' own research. Regions signed a licensing agreement with DreamWorks to build and manage the sites in all three cities, the companies said. On Friday, Katzenberg said both Regions and DreamWorks staffers "have spent countless hours together in Moscow and Los Angeles, side by side," to design the sites. Within each theme park section, there will be five to six different zones based on the most popular film franchises at DreamWorks, such as Shrek, the good-hearted green giant with bugle ears, and Kung-Fu Panda, Katzenberg said in the interview. The character zone will have rides, shows and lots of interactions with costumed versions of the characters, he said. Meanwhile, both American entertainment giants could be facing inroads from Lotte Group, the Japanese conglomerate that already has built a five-star hotel and business center near the Arbat and that owns Asian theme-park success Lotte World in Seoul. A person close to Lotte's Russian operations, who declined to be named, said this week that Lotte has a local theme park in the works, but the company is clearing the proposal with Moscow's City Hall. Lotte is "waiting for a decision from the city authorities" on what the park's location might be, the source said. On a smaller scale, Rovio, maker of popular game franchise Angry Birds, will open a handful of entertainment sites throughout Russia in the next 12 months, Rovio chief marketing officer Peter Vesterbacka told media last week. Vesterbacka couldn't be reached by e-mail or telephone for additional comment. Olga Zbruyeva, head of the client department at real estate firm Astera, said any big theme park would be a game-changer here. As to whether such projects are doable, "all of those questions have to do with money," she said.